Mike Garvey picked up the 3rd last-place finish of his NASCAR Camping World Truck Series career in Friday’s Winstar World Casino 400k at the Texas Motor Speedway when his #93 S&W Services Chevrolet fell out with transmission problems after he completed 6 of the race’s 169 laps. Garvey qualified 21st at a speed of 174.132 mph, but pulled behind the wall during the opening green-flag run. Mike Harmon, driving Chris Lafferty’s #89 that came into Texas tied for the LASTCAR Team Rankings lead, fell out two laps later with a vibration. All-time Truck Series last-place leader Wayne Edwards fell out the next lap. Garvey not only became the first repeat last-place finisher in 2010, but did so in consecutive races following another 36th-place finish at Charlotte. 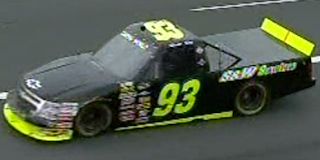 *This is the first time the #93 has finished last at Texas since Jonathon Price’s #93 Troxell-MacDonald Racing Chevrolet lost the engine 7 laps into the 2003 Silverado 350. *Brent Raymer was the last driver to finish last in consecutive Truck Series races when he was 36th at both Memphis and Kentucky last fall.